LOS ANGELES, CA – Urban Movie Channel (UMC) is bringing viewers an exciting yet educational scope of titles in celebration of Black Music Month. Beginning on Friday, June 2, 2017, UMC’s Black Music Month collection will include films featuring some of the culture’s most prominent and beloved entertainers. Titles from the collection include the Damon Dash production Welcome to Blakroc, the documentary The Industry from Russell Simmons’ Hip Hop Speaks Series, and the untold story of the legendary Sugarhill Gang, I Want My Name Back. From documentaries about late hip hop greats Tupac Shakur, Notorious B.I.G., and Jam Master Jay; to concert performances from Earth Wind and Fire, Jimi Hendrix, and Unlocking the Truth; and little known stories of black musicians in history such as the enslaved pianist Thomas Greene Bethune and Queen of the Trumpet, Valaida Snow, UMC is the destination for the best of Black Music Month programming. As part of UMC’s tribute to Tupac Shakur, UMC will host a special UMC All Access Facebook Live interview with Leila Steinberg, the artist mentor and first manager for Tupac Shakur. A veteran music industry executive who has worked with Atlantic Records, Sony, Def Jam, Interscope and more, Steinberg first met Tupac in the Spring of 1988, when he entered The Microphone Sessions, her writing workshop that develops spoken word, poetry, musicals, hip hop, pop, dance, and more. Currently, Leila manages rapper Earl Sweatshirt, formerly of Odd Future. 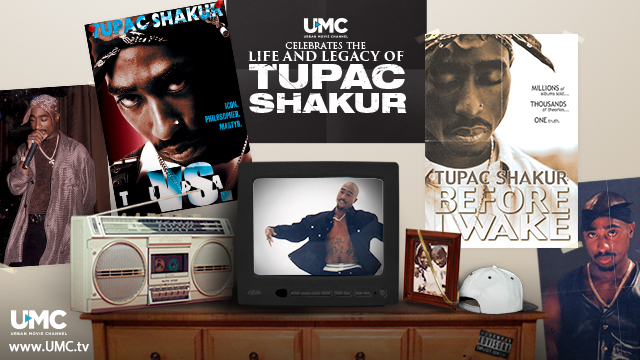 Follow @WatchUMC for the Facebook Live date announcement and be sure to watch the documentaries Tupac Vs. and Tupac: Before I Wake from UMC’s Black Music Month collection. The celebration continues on Friday, June 9, 2017 as UMC presents American Beatboxer, an award-winning documentary that follows the experience of the first American Beatbox Championship. The inaugural event, which took place in Brooklyn, NY, brought together beatboxers and beatbox fans of all races from across the country and featured a judging panel of hip hop legends Rahzel the “Godfather of Noyze”, Masai Electro, Parrish Smith of EPMD, and Jarobi White of A Tribe Called Quest. Directed by Manauvaskar Kublall, produced by Richard McKeown, and executive produced by Chesney Snow – co-founder of the American Beatboxing Championship, the film is included in the Rock & Roll Hall of Fame Museum & Archive and documents one of the most neglected genres of hip hop culture, acknowledging beatboxing’s rightful place in Hip Hop history, as well as it’s establishment as an American art form. Finally, #ThrowbackThursdays continues with episodes from Season 1 of WE tv’s Braxton Family Values added to UMC each and every week through July 27, 2017. Watch for the first time or continue the trip down memory lane with the Braxton music family and catch #BFVonUMC! Available at www.umc.tv, UMC is the first premium subscription streaming service that showcases quality African American and urban entertainment across all genres from RLJ Entertainment (NASDAQ: RLJE). Created by Robert L. Johnson, Chairman of RLJ Entertainment and founder of Black Entertainment Television (BET), Urban Movie Channel (UMC) is the first subscription streaming service created for African American and urban audiences in North America that features quality urban content and showcases feature films, documentaries, original series, stand-up comedy, and other exclusive content. UMC is available on Apple TV, iOS, Roku, Amazon Prime, and Amazon Fire TV. At www.UMC.tv, UMC offers a free 7-day trial and thereafter is just $4.99/month or $49.99/year. Keep up with UMC on Facebook at Facebook.com/UrbanMovieChannel and on Twitter/Instagram @WatchUMC.